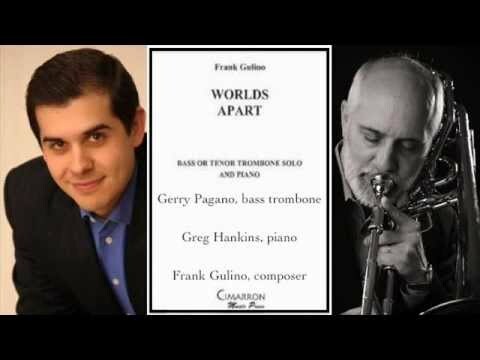 Frank Gulino, a native of New York City, now resides in the Washington, D.C., metropolitan area, where he maintains an active schedule as a composer and bass trombonist. Frank holds a Bachelor of Music degree in Bass Trombone Performance from The Peabody Conservatory of Johns Hopkins University, where he studied with Randy Campora, Jim Olin, and David Fedderly, all of the Baltimore Symphony Orchestra. Frank has also studied with Vincent Belford of the New Jersey Symphony Orchestra and jazz artist Bob Ferrel. As a trombonist, Frank has appeared at Carnegie Hall, the Music Center at Strathmore, the New Jersey Performing Arts Center (NJPAC), and the Joseph Meyerhoff Symphony Hall, home of the Baltimore Symphony Orchestra. He has also served on the faculties of both the DC Trombone Workshop and the Shepherd Trombone Workshop. Frank is an artist/clinician for the Edwards Instrument Company and performs on Edwards trombones and Griego mouthpieces. As a leading composer of contemporary brass music, Frank has had works commissioned, performed, and recorded by some of the world’s foremost brass players, including international euphonium virtuoso Steven Mead, St. Louis Symphony Orchestra bass trombonist Gerry Pagano, Atlanta Symphony Orchestra bass trombonist Brian Hecht, National Symphony Orchestra principal trombonist Craig Mulcahy, Boston Symphony Orchestra principal tubist Mike Roylance, and Christopher Dudley, solo trombonist of the Bergen Filharmoniske Orkester in Bergen, Norway. Frank’s works have been performed at the John F. Kennedy Center for the Performing Arts and the United States Capitol in Washington, D.C., as well as at venues in Argentina, Estonia, Italy, Latvia, Mexico, Panama, Portugal, Singapore, South Korea, Spain, Taiwan, the United Kingdom, and Uruguay. Additionally, Frank’s music has been performed at dozens of colleges, universities, and conservatories, both domestically and abroad, and remains exceedingly popular among performers and audiences alike. Frank is a member of the American Society of Composers, Authors and Publishers (ASCAP) and is a four-time ASCAP Plus Award winner. Frank’s works, published by The FJH Music Company, Cimarron Music Press, and 200 Miles to Arnstadt Publications, are available from major music distributors all over the world, including J.W. Pepper, Hickey’s Music Center, SheetMusicPlus, and many others. Additionally, Frank’s work has appeared on both the Maryland Music Educators Association (MMEA) and the New York State School Music Association (NYSSMA) repertoire lists and has also appeared on the required repertoire lists for the ITA George Roberts Bass Trombone Competition, ITEC Solo Tuba Competition, and the Leonard Falcone International Euphonium and Tuba Competitions.